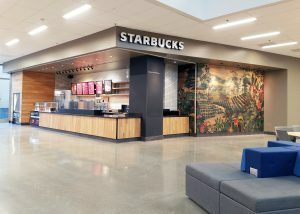 Students at California State University Fullerton (CSUF) are happily sipping lattes in their ultramodern student union building, thanks to the latest collaboration between Menemsha Construction and Starbucks. The showcase Starbucks has been exceptionally well received by students and Starbucks alike. The coffee house, constructed in the underground level of the Titan Student Union, blends harmoniously with the facility’s new high-tech “campus living room,” which recently underwent a $20 million expansion and renovation. Starbucks Construction Manager Tim Townsend commented that the project ran exceptionally smooth and that quality of workmanship and expedited schedule were perfectly in sync, well planned and executed, and ultimately exceeded expectations. The Starbucks-Menemsha relationship goes back more than two decades, during which time Menemsha has provided various site survey, architectural, and construction projects to well over 3,500 locations nationwide. Menemsha provides award-winning architecture and interior design, facility survey and assessment, and a full array of general contracting services. Established in 1992, Menemsha has delivered thousands of successful projects to both private and public sector clients, each year, throughout North America and internationally. Menemsha’s reputation is built on innovation, technical excellence, and outstanding delivery. Menemsha Construction has been serving clients nationwide with high-quality deliverables for more than 25 years. Services include: new store construction, renovations, tenant improvements, ADA upgrades, fixture resets, and millwork installation with their self-performing crews. Hallmarks of the division include skilled estimating, highly experienced project management, a proprietary database of more than 5,000 subcontractors, and real-time reporting that draws on high-tech tools such as 3DVR photography and an online project management system for up-to-the-minute summary reports and a nimble workflow.